DJ Maphorisa Wants To Sign Likhey Booi? During the weekend a video of musician and SAMA Nominee Dumza Maswana went viral after he posted the video of himself playing the piano alongside a very talented young boy by the name of Likhey Booi. The video caught the attention of many South Africans, including artists such as the likes of Cassper Nyovest and Thiwe. The song even caught the attention of DJ Maphorisa who has expressed that he is interested in signing the young man. 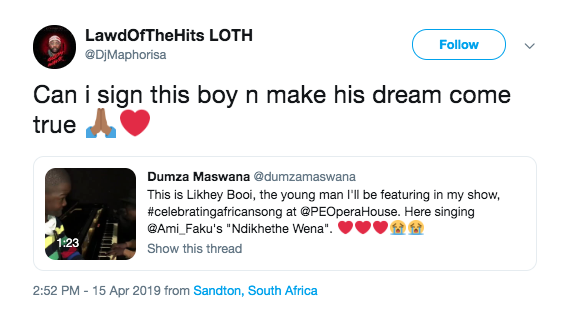 Was this DJ Maphorisa's wishful thinking or is he serious in making this young man's dream come true? We can't wait to see what will unfold from this video going viral, it's without a doubt that this young man is talented and would appreciate all the help he can get to get him to that super star status. Even if he doesn't get a record deal it would be great to see him continue to follow his passion as a singer and hopefully pursuit it as a career. The song was produced by Bubele Booi who also caught wind of the video and re-posted it on his Twitter account as well. Likhey and Bubele are not related but share the same surname. We guess it's safe to say that the Booi clan has a lot of talent on their side. Here is the original version of the song.